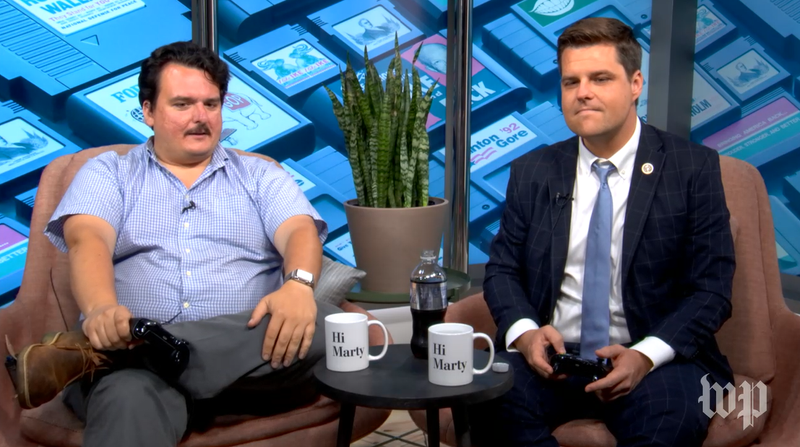 Washington Post reporter David Weigel (left) interviews Florida Congressman Matt Gaetz (right) while the two play Madden 18. The Washington Post is now Twitch streaming politicians beating its reporters at video games, starting today with Republican Congressman Matt Gaetz demolishing reporter David Weigel 26 to 0 in Madden 18. It’s an extremely weird interview format, but one that feels perfectly at home in the absurd media landscape of 2018. Why Madden 18? Apparently Gaetz, who admits he doesn’t really play games all that much, picked it. He began explaining why at one point—“if you needed a game to prove you were a real American”—before trailing off. For his part, Weigel confessed to preferring shooters, saying he plays Call of Duty online from time to time. “The WWII game was a little less exciting than it should have been,” he said, offering the hottest gaming take he could muster. Both men looked like they felt out of place, unsure how to interact over the game, despite both being extremely adept at their respective crafts. Every couple of minutes Weigel would criticize his own play-calling and then pivot to an open-ended question. Gaetz would offer a hedged response before immediately pivoting to a rehearsed-sounding zinger about how badly he was beating Weigel. It was far from the type of media appearance Gaetz has become known for. The 35-year-old Congressman has spent his relatively young political career courting the most unapologetically conservative and alt right parts of the Republican party. The banner for his Twitter page is him taking a selfie with Trump. He’s been on Alex Jones’ InfoWars in the past, and earlier this year he invited Holocaust denier and white supremacist Chuck Johnson to be his guest at the State of the Union. Elected the same year as Trump, he’s since made a name for himself by being the President’s number one congressional defender, ready to appear in any article or on any TV show to spin his right wing yarns. Last month, for instance, he went on Lou Dobbs Tonight to claim that Ohio Congressman Jim Jordan, accused of not acting on allegations of sexual abuse while serving as an assistant wrestling coach at Ohio State University, was being unfairly targeted by people affiliated with the deep state. Waluigi won’t be in this year’s Super Smash Bros. game, but it looks like he will at least have weekly appearances on the Washington Post Twitch channel. The Washington Post began its Twitch programming in April by streaming Mark Zuckerberg’s Senate hearing. This week it used Trump’s Helsinki Summit with Vladimir Putin to kick off a more regular schedule, including a series of analysis talk shows with reporter Libby Casey and a series of more traditional gaming streams called “Playing Games with Politicians.” The Post is owned by Jeff Bezos—who also owns Amazon, which also owns Twitch—so the paper’s attempts to break out into political coverage oriented around playing video games isn’t a surprise. The product, so far at least, is still bizarre. The Washington Post did not immediately respond to a request by Kotaku for comment about the reasoning behind the Twitch program. While deciding whether to have his Tampa Bay Buccaneers run the ball or pass, Gaetz was much more anodyne than usual. The meandering discussion focused on topics like net neutrality and medical marijuana legalization, topics on which he holds more mainstream views (he’s in favor of both). Rather than defend the latest Trump gaffe or explain his desire to open an investigation into Hillary Clinton’s emails, Gaetz was content to just game and chill, and Weigel likewise wasn’t keen to press him on issues. In keeping with the game-streaming format, cohost Gene Park asked questions from the Twitch chat by users named things like AbortionShark about what Gaetz likes to eat for breakfast and whether he likes pineapple on his pizza. The glimmer of a real moment came when Twitch viewer PikaPalTV asked Gaetz about why he’d associated himself with Chuck Johnson who, among other things, has advocated killing Black Lives Matter activists. “That was a mistake in vetting,” Gaetz said, contrary to his defense of Johnson immediately following the controversy. “I probably should have googled him first.” He then stared intently at a recap of the last Madden play for a few seconds before Park bailed him out with softball question about military readiness. The Congressman also recently expressed regret for his appearances on Alex Jones’ show. “Upon further reflection, I think that the things that Alex Jones has said and done are so hurtful to so many people that a member of Congress should not grace that platform and legitimize it, and I would not go back,” Gaetz told Hill TV yesterday. For anyone who doesn’t know, Jones helped popularize the conspiracy that the 2012 Sandy Hook shooting was a hoax, calling the parents of the victims liars. He began doing that in 2014, but Gaetz appeared on his show this past January. None of this came up during the 26 points he scored against Weigel, though. It probably wouldn’t have mattered if it had. After all, this is Trump’s America. “All right guys keep defending democracy or whatever,” said Twitch commenter craigjenkum when the crew signed off. Don’t worry, they will—next Thursday, when the show returns with another politician, Congresswoman Suzan DelBene, this time playing Wii Sports.